Sadly the last manor at the Hothfield estate was demolished in 1954 and little remains of the once large and wealthy country estate. Lord Hothfield sold the site to Sir Reginald Rootes in the late 1940s who built his own large modern house. Sir Reginald died and his widow Nancy eventually sold most of the estate in 1988 at auction. 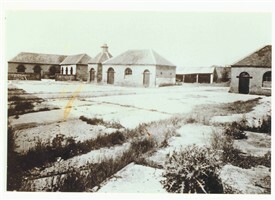 At that time some of the last remaining stable blocks were still standing along with two ‘new’ houses and two bungalows built by Sir Reggie in 1961. 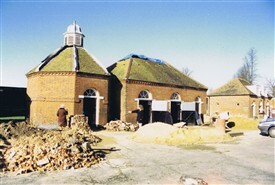 The stable blocks were bought individually by different builders who subsequently converted them into domestic houses. 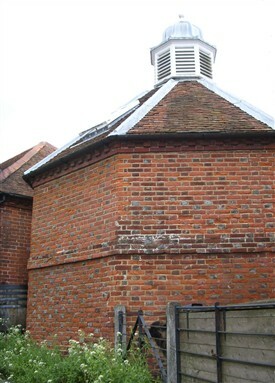 One stable block has an eight-sided brick tower joining it which was built as a dovecote. All big country estates had dovecotes and the owners would have used just about everything from them – meat and eggs to eat, feathers for mattresses and pillows and even the manure. These stable blocks are Grade 2 Listed and were built around 1788. The dovecote had originally been built standing alone some years earlier and has bricks with blackened ended called ‘burnt headers’. 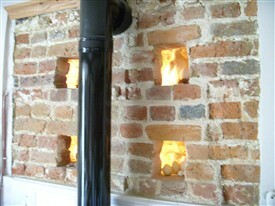 The adjoining stable blocks do not have many burnt header bricks. The dovecote started to lean over, like the Tower of Pisa, and is a good 6 inches out of the vertical at the back. This appears to have happened early in its life as the roof has been taken off and reset level, and the front appears to have been rebuilt more upright. The adjoining stables were built around one side of the dovecote and they fit the angle of the leaning tower. Luckily the tower doesn’t seem to have moved in the last 200 years. The builder, David Prior, who converted the dovecote and its attached stable block in 1988 came back to see the building in July 2014, and he brought with him some photos of how it looked before he started work, and some photos of the conversion underway. The dovecote is now the kitchen of the house but in its day it had nests built into the walls for the doves to live and breed. The builder's photos show that the lower rows of nests had already been bricked up and whitewashed over when he bought the property. Each row of dove nests had a course of bricks sticking out to act as a ledge and these too had been broken off at the lower levels. 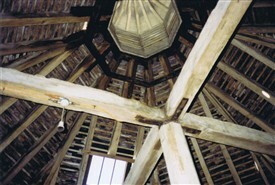 Dovecotes also had a central pole which pivoted at the top and bottom to allow it to spin. Off the side of this pole was a ladder so that the nests could be accessed on all sides by spinning the pole and moving the ladder around the perimeter. Part of the pole survives today, although its bottom end was rotten and the ladder had already been removed before 1988. 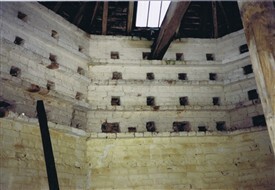 The current owners of The Dovecote have removed some of the modern plaster from the inside of the tower and exposed a few of the original dove nests. 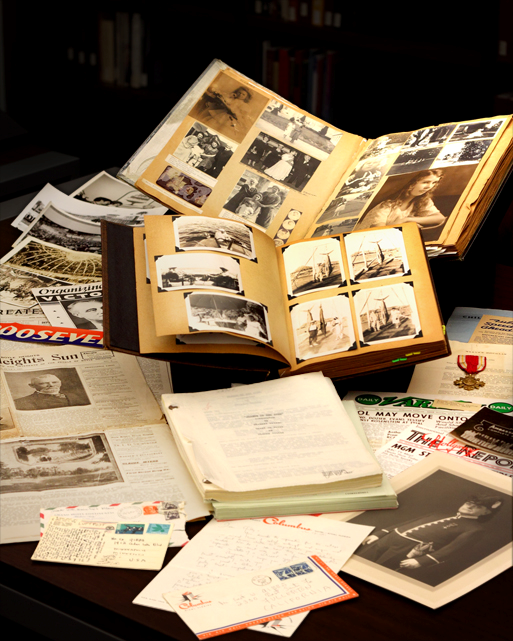 This page was added by Chris Rogers on 04/08/2014.